Material: luxury printed silk, fabric tassel and bamboo. Hand fan size: Diameter of the round hand fan: 8.46"; Length of fan handle: 4.72"; Fan stand size: 9.96" x 5.2". 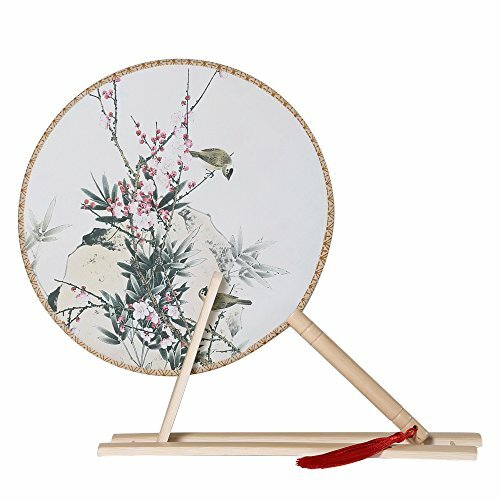 Package include: floral round hand fan *1 piece; bamboo fan stand*1 piece. Chinese Tang Dynasty Style hand fan, great for home decoration, wall decoration, Halloween costume, dancing, wedding, prom, pageant, cosplay or any other special occasion. Also excellent as a gift for your loved ones.